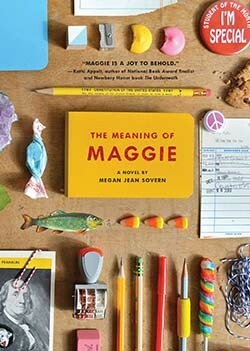 Before picking up Megan Jean Sovern’s The Meaning of Maggie, I knew it had gotten a lot of positive reviews but I didn’t know anything about the story. So when I started reading, I didn’t know what to expect. But right from page 1, it’s clear that Maggie’s dad is in trouble. His health is not great, and that means everything in their household is changing: Dad is staying home, Mom is taking a job, and older sisters Layla and Tiffany are sometimes acting like the snobby jerks they always are — but also sometimes being really weird in the way they treat Maggie and their parents. Unfortunately, Maggie isn’t the type of person who is quick to adjust. But over the course of the book, you see how she grows as she faces all kinds of new experiences and realizations, both at school and at home— from her first crush on a boy, to her changing relationship with her sisters. Most of all, you see how much Maggie loves her parents and how much they love her — and how that love can sometimes lead to well-intentioned mistakes as well as leading to the forgiveness and strength that allow you to overcome those mistakes together. I think you’ll find that Maggie is probably not like you and your friends: She plans to become president someday, and she loves doing schoolwork. But I think you’ll feel for Maggie and understand what she’s going through. I was also immediately drawn into Maggie’s family, and I feel like I got to know each of them. If you like realistic fiction, I definitely recommend this book — especially for fans of Umbrella Summer, Emma-Jean Lazarus Fell Out of a Tree, and Amalee. If you’ve already read this book, leave a comment with your thoughts! Or tell me: Maggie knows for sure she wants to be president; what do you want to do? As a kid, Karen wanted to be an author. She doesn’t have anything published yet, but in the meantime she’s glad that she gets to work with kids’ books so much!